Qorvo has released the financial results for its fiscal 2018 third quarter, ended December 30, 2017. According to company CEO, Bob Bruggeworth, Qorvo delivered an exceptional December quarter, highlighted by a strong ramp in support of our largest customer, robust growth in defense and IoT, and improved operating performance. While near-term market demand weakened in handsets, their longer-term outlook has improved on recent developments with mid/high-band PADs, Phase 6 design wins, and cellular IoT and other connectivity applications. As per the report, on a GAAP basis, revenue for Qorvo’s fiscal 2018 third quarter was $845.7 million, gross margin was 39.8%, operating income was $80.3 million, or 9.5% of sales, and loss per share was $0.26. On a non-GAAP basis, revenue for Qorvo’s fiscal 2018 third quarter was $844.8 million, gross margin was 48.0%, operating income was $254.3 million, or 30.1% of sales, and diluted earnings per share was $1.69. According to Mark Murphy, the Chief Financial Officer at Qorvo, the third quarter results exceeded guidance, driven by higher revenue, improved gross margin, and effective cost control. They also achieved record free cash flow on strong operating performance and lower capital spends. 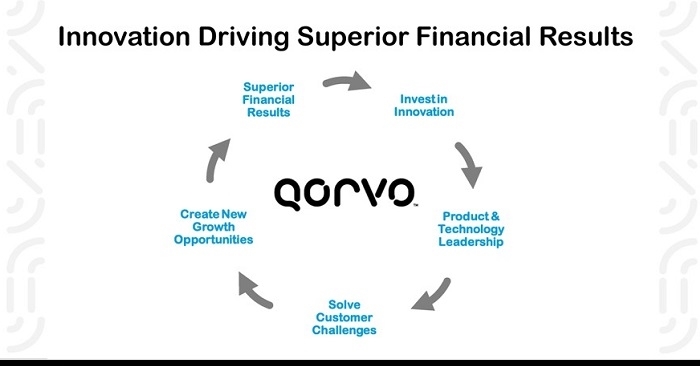 While their March quarter guide reflects weakness in the smartphone market, but with improved operating performance and new BAW-based product ramps, Qorvo expects continued margin expansion and free cash flow growth in fiscal 2019. The actual quarterly results may differ from these expectations and projections, and such differences may be material. Click here to view the complete selected GAAP and non-GAAP financial information.